Our Technicians deliver the latest technology to our customers – but it’s not just as simple as plugging our products into your wall. 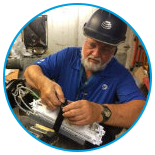 Gary Yates is one of our Cable Splicing Technicians, expanding our network every day. Whether you’re streaming video or downloading work files, it takes a lot of work on the ground to make it all possible. See what a day in the #LifeAtATT means when you’re a Technician. I’m a Cable Splicing Technician, and we provide the backbone of everything AT&T offers. Ultimately, we’re running new fibers to the customer. So we go out, splice up the fiber and make sure it goes everywhere it needs to. That’s how people are connected to our network. I do a little bit of everything when it comes working outside. We do a lot of aerial jobs – from splices to driving a bucket truck. We also work in manholes, buried pedestals and building terminals. We run the whole gamut of outside construction, and I really enjoy that you’re always on something different every day. We cover a lot of territory. And that means no matter the weather. We’re a lot like the mailmen. Whether it’s raining, sleeting, hailing or snowing, we’re out there doing what needs to be done. What’s your first stop when you’re on the job? Safety first. The company provides us with everything we need to do our job safely. We’ve got safety glasses, hard hats and all the rest. And when I pull up to the job, I put out my work area protection – I’ve always got my beacons going so the public doesn’t accidently run me over. But the biggest part of work safety is simply always being aware of your surroundings. You should know what to expect. You may not always be able to prevent an accident, but you can minimize the risk. Can you run us through the actual fiber process? First, I locate the main fiber cable. That’s what will bring a signal to the neighborhood. I’ve got to splice the cable to the pedestal that the homes or businesses connect to. Once the outside part is done, most of the rest of the splicing work is actually done inside a trailer. So the outside conditions don’t matter as much – it’s like a classroom. There’s a lot of prep work that goes into cable splicing, even once the cable is in the trailer. I have to do everything from cutting and tightening zip ties to even getting out the blow torch. It takes a lot of patience. But in the end, our customers can turn on a signal and it goes straight to the main pedestal. And then everything’s connected. It gives me purpose in my life. I’ve been here for 45 years, and every day is interesting. The technology’s always changing, and I’m always adapting. Which means I can learn new technologies and new ways to do things. And AT&T has always provided me the tools, training and technology I need to work with. It’s taught me that you’ve always got to adapt. If this is what we’re going to be doing today, then I’ve got to learn how to do it. And I like that. Hear more about what it means to be an AT&T Technician here. Learn more about our Technician opportunities.